Some species of cotinga, especially those of medium size, participate in spectacular courtship rituals, behaviors that lead to mating. When a male wants to attract a female, he removes the leaves and twigs on the ground in a small area. This area is called the lek or lek court. Several males will then go to these areas and sing, call, and dance by hopping, making short flights, and fanning or making noise with their feathers. This activity is called lekking. Some species lek on branches above the ground rather then on the forest floor. Females are attracted to the lek by the calls or wing sounds the males make. They watch the display, and then choose a mate. Once the female makes her choice, she flies away with the chosen male. The male will mate with as many females as possible during the breeding season. He does not stay with the female and rarely helps with building a nest. 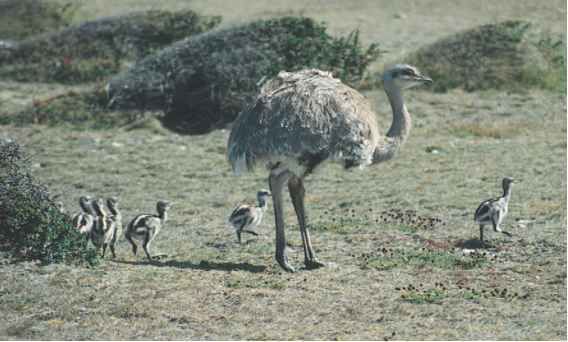 Females incubate, sit on and warm, the eggs and raise the young alone. Not every species of cotinga leks. Some use fancy flying maneuvers (mah-NOO-verz) to attract mates, while others display their interest in mating individually rather than in groups. Cotingas build a variety of different types of nests ranging from heaps of twigs in the fork of a tree to shallow woven cups. Generally birds in this family lay a single egg that hatches after about a month. The chicks are born blind and without feathers. The mother feeds the chicks for about a month until they mature enough to leave the nest. Cotingas tend to be non-aggressive, passive, with their own and other bird species except when nesting. They do not protect a particular territory, and they often feed in the same tree as other birds.